Business in 2019 will continue to be conducted in the cloud. According to a RightScalesurvey, overall cloud adoption – including the use of public, private and hybrid clouds – reached an average of 96 percent in 2018. But what exactly is cloud computing and why is it becoming so popular among small- and mid-sized businesses? Cloud computing allows users to save and access data via their internet connections, as opposed to housing it on a physical drive. By storing and managing data in the cloud, small business owners can access what they need when they need it, whether it’sfrom a company computer, a personal tablet or even a smartphone. With cloudcomputing, businesses can also access online software programs and hostingservices. Businesses are no longer limited to the capacities of the storage and memory offered by their computers and external hard drives. 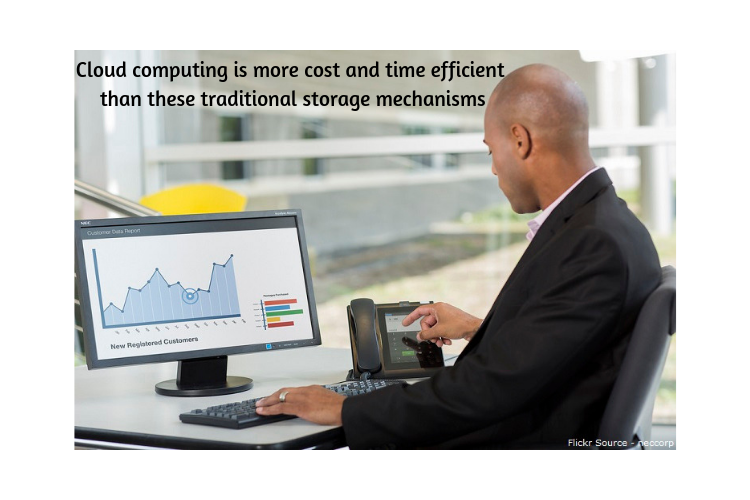 Cloud computing is more cost- and time-efficient than these traditional storage mechanisms. Of course, the actual cost of cloud computing varies based on the type of cloud service in use. The price also can vary based on the industry and the provider. But whether a business has chosen a basic plan for $20 per user each month, a more sophisticated service with backup and recovery services for $60 a month or even a highly advanced program with an annual rate, the overall costs will be far less than similar software programs that utilize your hardware. Plus, most providers offer a variety of plans and features, so you need only pay for what you actually will use. If your needs change next month, you usually can easily update your package without delay. Reduced software costs are only the tip of the iceberg in cloud computing’s superior efficiency, however. Just by switching to cloud computing, businesses will consume less electricity, reducing at least one other monthly expense. Every additional item of hardware you use will require extra energy to operate. You might be surprised at how much your electric bill drops by eliminating so many extra machines. No longer must an office be filled with multiple computers, external hard drives and scads of electrical cables – not to mention the costs associated with maintaining and eventually replacing hardware that has a limited shelf life. By conducting business on the cloud, that equipment is someone else’s responsibility. Likewise, you won’t need to concern yourself with constantly buying new versions of rapidly-outdated software programs. Cloud computing also reduces the amount of personnel needed to run a business. Many companies spend a big chunk of their operating budget on IT experts, whether employed or contracted. But the monthly subscription costs to enjoy cloud services include the provider’s own tech service experts. All the money you save by conducting business in the cloud can be reinvested into your company, whether it’s expanding inventory, paying debts or even adding personnel. Whatever route you choose, your profits will grow as a result. Since cloud-based programs can be accessed and used remotely, they allow business owners and their employees to complete tasks from anywhere they have an internet connection, without the need for additional space or resources. Small businesses typically run on as little manpower as possible in order to save money for profits. 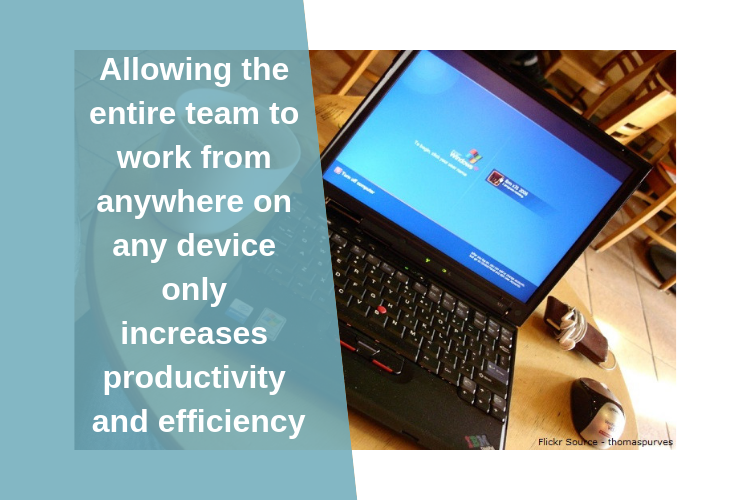 Allowing the entire team to work from anywhere on any device only increases productivity and efficiency. No longer will an important client grow impatient for someone to return to the office. At the same time, business owners can dedicate more time to their families by not rushing out for any new development. Mobility is one way that cloud computing increases productivity, but it’s not alone. Another benefit comes from greater collaboration among teams. With so many employees working from remote locations, teamwork can be one area that takes a hit. But by conducting business in the cloud, teams can not only collaborate through mutual communication, but they can access and update the same documents without the need to save copies and send e-mail attachments to one another. Cloud services even allow employees to share calendar and task lists, ensuring that everyone is always on the same page. 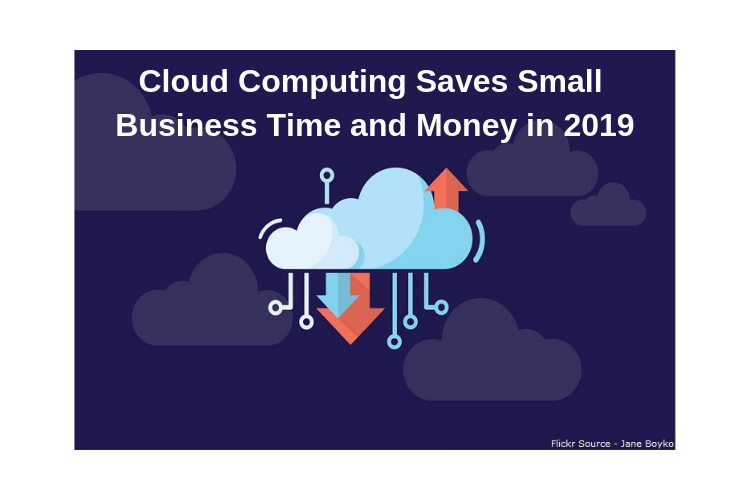 Furthermore, cloud computing is known to be faster than traditional data solutions, so employees can spend more time working and less time waiting for programs to load. If you operate your own business at any level, you know what a disaster it would be to lose your data. But even on-site data storage options are typically only as secure as the hardware in which they reside. One equipment failure could cost thousands in recovery costs and time. 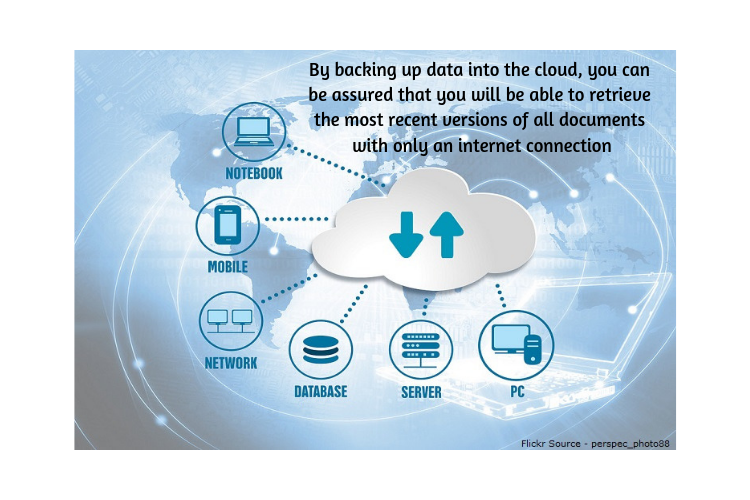 By backing up data into the cloud, you can be assured that you will be able to retrieve the most recent versions of all documents with only an internet connection. Therefore, even natural disasters are no long-term obstacle to efficient operations. In fact, as long as your cloud computing provider is operational, you can usually restore your systems within minutes. Since many providers save data in multiple centers across various locations, you can be rest assured that only a large-scale systemic collapse can endanger you conducting business. Cloud computing also provides enhanced security against data theft – protecting not only your business but also your customers from hackers and data thieves. Business systems can growoverly-complicated over time as new processes and applications are added toexisting data structures. But many cloud computing services provide ways toconsolidate these programs into a single multi-application service. Forexample, some of the most popular business cloud computing providers offer email, calendars, documents, instant messaging, presentations, forms and even websitedesign and management in a single subscription model. Even the traditional Microsoft Office application suite is now available via cloud service. Plus, cloud computing applications are usually updated automatically at regular intervals, sobusiness managers need not waste time and money on purchasing and updating to the latest versions. Previous New Gutenberg WordPress Editor: Are You Ready? Great article to help beginners to understand cloud computing for small businesses. Thanks for it. But, how affordable it is for the start-ups? Cloud computing is the perfect IT support service for the small business which offers various capabilities in order to secure the data and information. Cloud computing gives business the leverage to operate from anywhere or any device with an internet connection it offers successful collaboration.